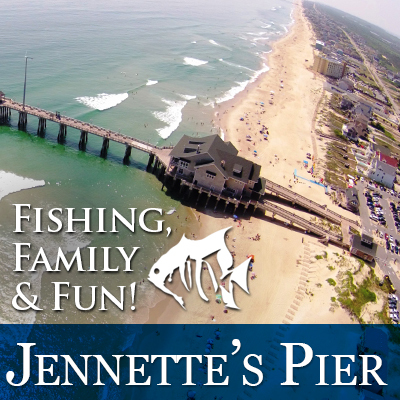 May-Aug: 6 a.m. to Midnight • April: 7 a.m. (Closing Hours Vary) • Sept-Nov: Hours Vary • Dec-March: 8 a.m. to 5 p.m.
Jennette’s Pier in Nags Head is a state-of-the-art educational center and fishing pier complete with a pier shop, classroom and banquet hall. The Nags Head fishing pier features wide, clean public beaches, free parking and a bath house with outdoor showers. With its mantra of Fishing, Family and Fun, Jennette’s offers something for everyone. There’s world-class fishing, unique educational programs and excellent opportunities for sightseeing from the 1,000-foot-long pier. Owned and operated by the N.C. Aquariums, Jennette’s Pier was awarded the coveted Platinum LEED Certification by the U. S. Green Building Council in 2012. In addition to its three iconic wind turbines towering over the pier, the green facility boosts a unique reclaimed water system and geothermal wells that provide heating and cooling. Anglers can find everything they need for a day of fishing inside the pier house. Various types of rod and reel combos can be purchased or rented by the day for $10 (photo ID required). There’s plenty of bait and tackle for sale as well as drinks, snacks and souvenirs items. The pier has a blanket license for all anglers, so you do not need a fishing license. A daily fishing pass is good all day and night until the pier closes; call for hours as they change with the seasons. The pier staff offers educational classes for all ages, and the children’s programs are stellar. Call for more about the pier programs. Jennette’s is open year round. Open year round. Operating hours do change, however, based on the seasons. Walk-on: Adults $2 & Child $1. Jennette's Pier has a blanket license to cover all anglers fishing from the Pier. NC fishing & hunting licenses can be purchased at the main registers with a valid driver's license and payment. Jennette's Pier tackle shop offers everything you need to go pier fishing and sundries, souvenirs and gifts.